Ballard is abuzz. Bauhaus is returning. And while it isn’t yet clear whether the Capitol Hill original — in its final years relocated up the Hill on E Pine — will be part of the resurrection, the financial situation around owner Joel Radin is coming into light as the apparent revival plays out. Good news for the pooch? Radin has included the line item among the property he is declaring exempt from the US Western District Bankruptcy Court process. Radin closed his Seattle businesses including the E Pine Bauhaus in December 2015 in an abrupt wave that gave customers and employees little or no warning. Radin said at the time the plan for the popular cafe to return to its original corner at Melrose and Pine was also being killed with the closures. The business entities themselves are NOT part of separate corporate bankruptcies and currently remain listed as active corporations in the state. Today, the E Pine cafe remains dark. Items left behind like soda pop in the counter cooler remain as they were through the winter. CHS receives tips and reports from hopeful neighbors of occasional activity in the space but, so far, nothing has been announced to put the cafe space back into motion. In Ballard, however, something is afoot. 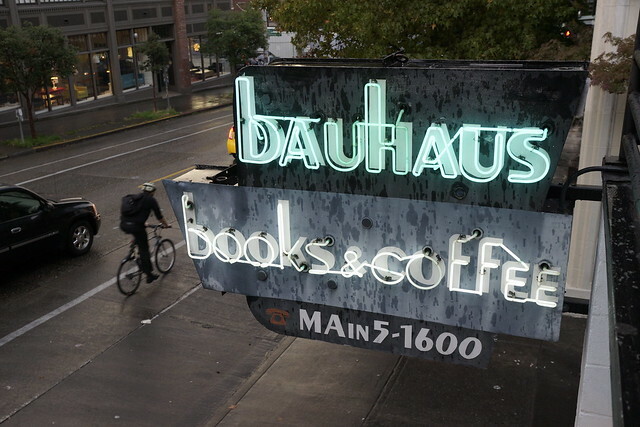 A sign bearing the Bauhaus brand and a hopeful “April 15” message suddenly appeared this week and messages of excitement have rippled across the Ballard social network. The sign fits in with a puzzle we’ve been working on. So far, Radin has not responded to our questions. In the bankruptcy filing, Radin also lists debts to Capitol Hill-area business owners he has worked with and borrowed money from including $25,000 owed to Baltic Room owner Jason Brotman and an “unknown” amount owed to his E Pine landlord Hikmat Aboul-Hosn. One of the largest lump sums in addition to the nearly $200,000 Radin says he owes the IRS, and State of Washington is $239,500 owed to family members he borrowed money from. That should give Radin’s dog some confidence. By the way, there are, apparently, plenty more opportunities for a Bauhaus legal tussle. Last week, CHS told you about the preparations to open a new bar on north Broadway — and a name change to help settle concerns about cultural appropriation. Spirit Animal has become Spirit and Animal. But the bar’s newly installed sign apparently doesn’t go far enough. Here’s a thread from the District 3 Facebook group where the arguments continue: I know. You don’t want to put a price on this type of cultural issue. But designs and signs aren’t cheap. Maybe this might be a good time for some true crowdfunding to help owner Paul Berryman and Izzy Guymon come up with a happy compromise. Those Lobby Bar rumors you’re seeing? Not all hype and hot air. After closing on E Pike in late 2014, the Lobby’s hunt for a new Hill home continues. Nothing to report. Yet. Now open in the CD: CommuniTea’s new kombucha brewery. Capitol Hill’s massive Starbucks Reserve Roastery opened on Melrose in late 2014. In classic coffee giant form, SBUX is now rolling the concept out across the globe and has inked a lease for another giant roastery project — this time in New York City in the Meatpacking District. Slab Sandwiches and Pie, part of John Sundstrom’s constellation of food and drink projects in the Central Agency building on the backside of Pike/Pine, is celebrating grilled cheese next week. Compared to the dark and soupy ma po tofu, la zi ji ($15) seems light and easy. It consists of nuggets of fried chicken (crispy on the outside, juicy on the inside) hiding under a fragrant and beautiful blanket of red chilies. But the scent of the chilies, released when they’re tossed in a screaming hot walk, combines with the many lip- and tongue-numbing Sichuan peppercorns to create a heady, almost intoxicating, eating experience.“A lot of Chinese cooking is about controlling heat, a trick of using the wok,” says Traunfeld. It’s something he didn’t fully understand when he was cooking in a wok on a home burner, but had to figure out when he found himself standing in front of a wok sitting atop a powerful 150,000-BTU burner. This entry was posted in Food & Drink, News, etc. and tagged coffee, courts, pike pine by jseattle. Bookmark the permalink. First the sizzle pie picture I posted to reddit got used on the local news and now CHS food blog? The facebook post is right and the sign does read as “Spirit Animal” since the “and” is very small. Spirit and Animal is a bad name anyway. I’m sick of the blank & blank name trend in restaurants and bars. They should crowdsource a new name by setting up a kickstarter and having people “vote” with their donations on the best name. Or set up a contest where people can name the bar via social media. They will lose business if some people think the name is offensive (and/or pretentious). Oh who cares. Spirit Animal isn’t offensive. Just more manufactured outrage. How about following the lead of Missy Elliott (since they’ve already thrown their thing down), they flip it, reverse it, and become Lamina Tirips? Or Animal Spirits? Or Yoga Raven? (Because seriously, what kind of pose is that bird in?) And if none of these are acceptable, then perhaps “The Boozery” because at least you would know what to expect there. Someone buy up the rights to Zayda Buddy’s and move it to the Hill and I will be a regular and make all of my friends go. This was in the wrong neighborhood. A Minnesota/Wisconsin (full of Scandinavians) themed bar, located in a neighborhood with deep Scandinavian roots, that was always chock full of people, was in the wrong neighborhood? Didn’t this guy have a yellow Ferrari 355 Spyder? I remember hearing that the former Ballard Bauhaus employees banding together and started a funding campaign to take over the store. Maybe they succeeded. No one in Seattle is excited to see Bauhaus up and running again. That man owes a lot of people money along with a lot of vendors he almost put out of business and now he gets to re-open with a clean slate. Don’t forget all his employees he let go right before Christmas with no notice. IF you want Bauhaus coffee go to Lighthouse that’s were they got there beans.